At a time when Australia’s students are being told they should pursue courses in science, technology, engineering, and mathematics for the good of our nation and humanity, one student from The University of Western Australia needed little encouragement. For David Gozzard, who is completing his PhD in experimental physics and recently became ExxonMobil Student Scientist of the Year, his love of science really began when his parents gave him a Horrible Science: Bulging Brains book at the age of ten, which then motivated him to read nearly all of the series. He is shown here with Premier Mark McGowan. “Horrible Science taught me that science was a fascinating, messy, human process of discovery, not just some facts to be memorised,” Mr Gozzard said. He said he was extremely lucky that his parents — both scientists, his mother a UWA graduate — always encouraged his curiosity, and this is really important to getting young minds to see both the fascination and importance of science. Mr Gozzard has focused his PhD research on the stabilised transmission of high-precision signals from atomic clocks, and the applications of these signals to astronomy and space science experiments. 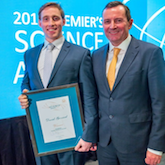 In recognition of this important research, which has application to space science research such as the Square Kilometre Array (SKA) and Atomic Clock Ensemble in Space projects, Mr Gozzard was recently named the WA Student Scientist of the Year at the 2017 Premier’s Science Awards. Professor Kerr, Warden of UWA Convocation, was speaking at the 2015 University of Western Australia Convocation Postgraduate Research Travel Awards ceremony recently. "It's exciting to be working on projects that have the potential to have a huge impact on humanity's understanding of the universe we live in," Mr Gozzard said. "I feel very fortunate to be a part of the outstanding research going on at UWA, and to have worked with many brilliant and dedicated engineers and scientists." His enthusiasm for science readily shows. “As scientists, it is imperative that we share our research with the public in order to educate, excite, and explain what it is we do and why we do it,” he said. Please visit the PGRTA Awards page for a full listing of the 2015 Awards winners. 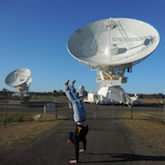 Mr Gozzard was a Convocation Postgraduate Research Travel Award winner in 2015, which helped to fund a field trip to CSIRO's Australia Telescope Compact Array in Narrabri, New South Wales, where he was able to test a stabilised signal transmission system on a working telescope. “The stabilised transmission system worked brilliantly, easily exceeding the stability requirements of the SKA,” he said.